I harp a lot here on how important it is to read the fine print--in your publishing contract, on websites that host user content, in literary contests. Sure, it's tedious, especially if couched in lengthy legalese--but skipping this step can result in unpleasant surprises. What happens, though, if the contest sponsor changes its guidelines while the contest is still in progress? 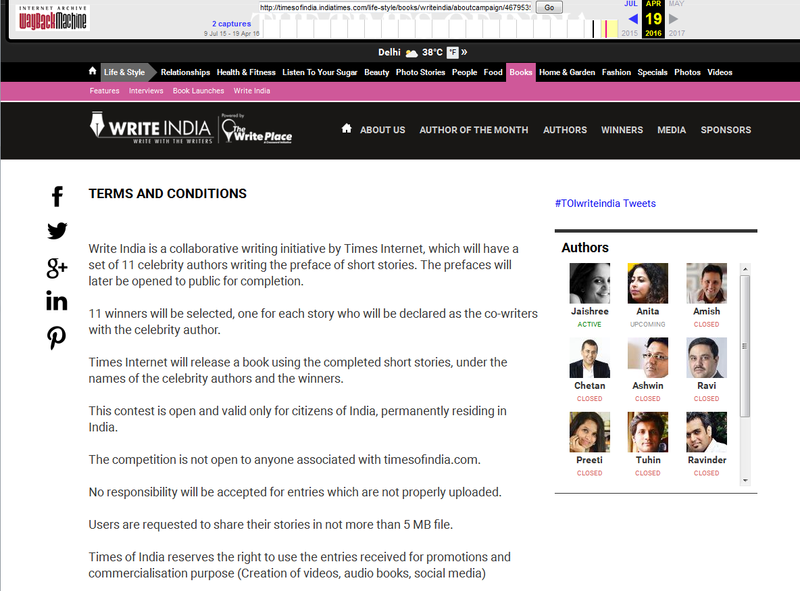 Last year, the Times of India--one of the world's largest English-language newspapers--launched the WriteIndia contest. Each month for eleven months, a well-known Indian writer provided a passage or a prompt for contest entrants to develop into a short story. Eleven winners were awarded a Kindle, attendance at an exclusive writing camp, and publication in a compilation of winners' stories published by TOI's publishing imprint, Times Group Books. @TOI_Books @anitanairauthor @VinitaNangia Can we publish our story somewhere else? @ShefaliBanerji @TOI_Books @anitanairauthor No, you cant. It is ours now -- we will take care of what to do with it. Wait, what? shocked writers demanded. How could that be? When I put this post online earlier today, here's how the next few paragraphs read. a. Participant acknowledge and agrees that [Times Internet Limited] shall have irrevocable, worldwide, exclusive right to publish and commercially exploit the story/content submitted with TIL, through any medium and channel for the period of two years from the date of completion of campaign. After two years exclusivity period, TIL shall have non- exclusive right to publish and commercially exploit the story, worldwide and in perpetuity. TIL shall have the right to adapt, edit or modify the story as solely determined by TIL. TIL shall not be required to take any further approval or to notify the participant or to pay any additional consideration for the grant of aforesaid rights. 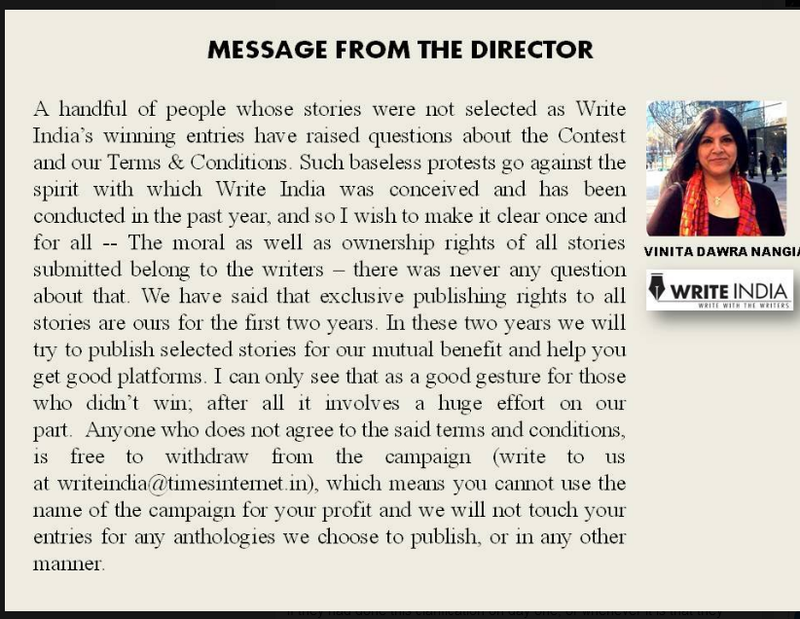 Simply by entering the contest, writers granted TOI perpetual rights to their stories, whether or not they won--and not just nonexclusively, but on an exclusive basis for a full two years. TOI doesn't have to pay writers whose work they use, or even notify them. I've rarely seen such a greedy rights grab in contest guidelines. If anyone had contacted me to ask about this contest, I would have advised them not to enter. On the other hand, TOI didn't attempt to hide or obfuscate the rights grab--it was right there in black and white for anyone to read. Problem is, lots of writers apparently didn't read it. So now, basically, they're stuck. In fact, the above is not quite correct, as I discovered late this afternoon when I checked into what's claimed in the first comment on this post. When most writers entered the WriteIndia contest, the T&C were different from what they are today. Here's a screenshot from April 19 of this year, courtesy of the Internet Archive. The Times of India reserves the right at any time without prior notice to add, alter, modify, all or any of these terms and conditions or replace, wholly or in part, this Offer by any other Offer, whether similar to this Offer or not or to withdraw it altogether. It's not unusual to find such language in contest guidelines, but it's rare for a contest sponsor to make such wholesale changes while the contest is in progress. While writers who ignore or miss plain language in a contest T&C have only themselves to blame, and the mention of "commercialisation" in TOI's original T&C should have been a red flag, it seems to me that WriteIndia entrants were substantially misled by rights language that TOI's own alterations of its T&C acknowledge weren't nearly clear or comprehensive enough, and didn't adequately convey its intentions for the entries. In my opinion, this is pretty shameful. Sounds good, but I have to point out that since neither the original nor the revised T&Cs mention the issue of moral rights at all, writers have no recourse if this pledge isn't honored. 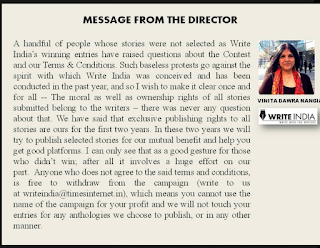 In response to the flap, TOI's Director, Vinita Nawra Nangia, is now saying that "anyone who does not agree to the said terms and conditions, is free to withdraw from the campaign." (Contact info: writeindia@timesinternet.in.) TOI should go farther. It should formally relinquish any and all rights to any and all non-winning entries. I've written before about termination fees in publishing contracts: why they are bad not just for authors, but for publishers, and how publishers can abuse them. Here's another case study in how termination fees can become a tool for retaliation. Sky Warrior Books, "a press dedicated to publishing quality SFF, mystery, historical fiction, paranormal, nonfiction, and other genres", is run by publisher and author Maggie Bonham (who also writes as MH Bonham and Margaret H. Bonham). Among the lesser-known authors on its list, there are several books and anthologies written/edited by established SF/fantasy authors. 12.a.ii. : Prior to publication, the Author may terminate this contract for unspecified reasons by reimbursing the Publisher for costs incurred, plus a termination fee of $500. Examples of costs incurred include expenses such as editorial and cover art. 12.f.ii. : Post Publication: In the event that the Author is terminating the agreement in order to sell the Work to another publisher, individual or company for publication, the Author shall pay a termination fee of 10% of the advance and royalties earned on the Work to the Publisher, plus purchase all remaining inventory at cost +15%, with no royalties paid on copies purchased under this clause. Sky Warrior also appears to have issues with timely royalty accounting. Complaints can be seen at the Absolute Write Water Cooler and at Ripoff Report; I've gotten some as well. Two of the authors who contacted me challenged the lack of payment and pressed for answers, whereupon Maggie Bonham terminated their contracts and reverted their rights, without asking for money. A third author--the one who's the subject of this blog post--also got her rights back. From her, however, Bonham demanded termination fees. Meanwhile, Book 2 had been published in early 2014. Eve says she wasn't given notice of the pub date until 24 hours prior, and never saw page proofs, despite the stipulation in her contract that she be able to review and approve them (according to Eve, the book included many errors). Royalty statements and payment for Book 2, due by the end of October 2014, didn't materialize--nor did royalty statements and payment for the same period for Book 1. By December 2014, Eve was fed up. She hired a lawyer and demanded contract termination and rights reversion for all four books, citing multiple breaches of contract. In response, Bonham categorically denied breach, and defended the absence of royalty payments by claiming that, because vendors take up to six months to pay, the contract's 120-day royalty payment window actually began to run six months after the end of a royalty period (even though there is no wording whatsoever in Eve's contract to support this). She admitted she didn't make even that extended deadline for Eve's 2013 royalties. It wasn't her fault, though: it was due to--wait for it--"circumstances beyond our control". On the up side, Bonham did agree to revert Eve's rights--but on the down side, not for free. For Books 1 and 2, she invoked Clause 12.b.ii., levying a fee of $56.13, which she claimed was 10% of royalties for the first half of 2014 (an additional 10% of royalties for the second half of 2014 would be due "when calculated"). For Books 2 and 3, which hadn't yet been published, she invoked Clause12.a.ii: $500 for each book, plus $317 for assorted costs including editing. The total of $1,373.13 was due within 60 days; any royalties accrued and owing would be applied to this "outstanding balance." As the cherry on top, Bonham warned Eve that "any libelous or slanderous statements by her, her family members, or her associates" would result in legal action. In my opinion, it's debatable whether Bonham was entitled to invoke the termination clauses, since Eve wasn't seeking to terminate the contract for "unspecified reasons" (she cited specific breaches) or "in order to sell the Work to another publisher, individual or company for publication" (she had no competing offer; she just wanted out). Be that as it may, for Bonham this is a win, whichever way it goes. She gets rid of a pro-active author, and if Eve pays up, she also gets some extra cash. If Eve refuses, Bonham gets to hold onto royalties she otherwise would have been on the hook for paying (in Eve's case these amount to several hundred dollars). After all, if we are harmed, you will have participated in the further erosion of independent, small presses, and I can't believe the rumor that SFWA and Writer Beware are cooperating with the Big Five publishing houses' efforts to destroy the independents once and for all. Although I did find it curious that Writer Beware's publisher avoid list is populated exclusively with small presses, often based in rural areas, far from the New York in-crowd. Damn. And we thought we were being so discreet. Seriously, though, I think Eve's experience illustrates how publishers can use termination fee clauses to retaliate against authors who displease them. The other authors I heard from who complained about nonpayment had their rights reverted without any demand for money. It's hard not to conclude that Eve was being punished for having the temerity to hire legal assistance. Bonham is now threatening to turn Eve's "debt" over to a debt collector. VICTORIA STRAUSS: Your email to authors [about the rights reversions] mentions that you fired an accountant who created problems for Month9, including missing and incorrect payments. Can you tell me more about what happened, and what steps you're taking to address the problems and ensure that staff and authors receive payments due them? GEORGIA MCBRIDE: I can't say more than I have already said about the accountant, and really, I prefer not to focus on him. What I can tell you is that I am working to get everyone caught up and paid in full who is owed a payment. From the many books ​we've published, there are only about 7 or so outstanding payments actually due at this time. We've managed to get mostly everyone paid since the author email was sent. VS: Communications I've received from both authors and staff indicate that payment problems go back at least to 2013. I've heard from staff who say they were never paid at all. Can you comment? ​GM: I can't comment on what you've heard, since I am not privy to it. ​I'm also not aware of any freelancers who have never received payment for satisfactory work. There are however, several freelancers who delivered work extremely late or work that was not up to the standard and had to be redone by someone else in order to meet that standard who have not and will not be paid. When we first started, I paid on a "commission" type basis where the freelancers income was tied to the book's performance. It was a good idea to motivate and encourage people, but I later realized that sometimes a book simply does not sell. And, even if it does, after distribution, printing, marketing, etc., there is little left to pay the editor. So, for those people, who may have worked on projects for little to no payments through 2014, I paid them all--even though I did not have to. Even though they signed contracts stating they would get paid only after the author is paid. In some cases it took almost 2 years to pay them all--but it was important to me to do it, even though I did not have to. Of course, no one is talking about that. VS: Initially Month9 planned a small publishing list--8-12 books a year is what I've been told--but both acquisitions and the release schedule seems to have very quickly increased far beyond that, and in your Q&A with YA Interrobang you acknowledge that an overcrowded publishing schedule was the source of some of the problems authors are reporting. Why did Month9 ramp up its publishing schedule so quickly, and in hindsight, would you do anything differently? ​GM: A publisher needs content to grow. It baffles my mind how anyone who understands the business and what it takes to launch a publishing company could question this. ​I have said many times that a good publisher not only has awesome books. But a good publisher must have reliable and qualified staff and a solid business foundation that includes accounting and legal counsel. At various points in our short life, Month9Books struggled in all those areas. Acquiring books and publishing them is not just about the cover. If the compliance isn't there, or there is a lot of turnover in staffing, and or the accounting is lacking; you are going to have a BIG problem. This is where we faulted. And, because I have a habit of not wanting to micromanage, I got into a situation where we simply had too many titles to manage with the resources we had. The right thing to do was to put the brakes on, make some hard decisions regarding which books to release and take steps to solidify the business foundation before moving forward. Cutting lists isn't new. I didn't invent it. In fact, we do it annually in October. Anyone who has been through it with us can tell you. That said, when my blood clot happened (I had been having bouts of Vertigo earlier in the year), I knew it was way past time to bite the bullet and do what had to be done. Not only were we understaffed in the areas that mattered the most, but now, I was not going to be able to work as much as I had. It would have been unfair and very selfish of me to try to keep all the books. Believe me, I wanted to. I wanted to because I hated disappointing the authors. I was sick to my stomach for weeks because of what I was about to do. But the thing that got me through it was knowing it was ultimately the best for everyone involved, even if it hurt like hell while going through it. VS: I know this is a tough question, but...many of the authors who've contacted me describe an atmosphere of intimidation at Month9, and have told me they fear reprisals for going public. Does this concern you, and do you have plans for addressing this perception going forward? ​GM: Not at all, but then again, I can't comment on what you have heard since I have no idea what you were told. That said, I am not at all concerned about these comments since many authors naturally feel scared about saying anything derogatory about their publishers or future publishers or agents, etc. This isn't anything new. But here's the thing, I have rights too. It's my right to protect myself, my family, my staff, my authors and my partners from anything that could potentially negatively impact my business. I have every right to defend myself and my company against libel and defamation. I will continue to assert that right, no matter who it upsets. VS: What's next for Month9Books? ​GM: You know what? We've been busy working! I have announced 4 audiobook deals in the last couple of weeks, a new reading club license with Scholastic, and we have our first China release coming in a few months! China! In the immediate future, we have an amazing slate of Fall books and are looking to publish our very first young reader series in early 2017. Thanks so much!